Hey y'all and welcome to another WHW! Today I'm talking operation make you hungry before 9am (well, if you like seafood..) I promised myself I'd dive into meal planning and cooking once our kitchen was completed and I'm sure y'all read that multiple times! Well, I kept that promise and I've stuck to the 4 week meal plan I made and so far so good - Basically, I found a template that provided a grocery list, weekly meal plan and then spot for the actual recipe. The grocery list covers everything you need to make 6 meals and each week it gets cheaper because you'll end up having most of the items already from previous weeks. I filled in 4 weeks worth which meant that a meal wouldn't be repeated for at least a month. (this isn't new to pro-meal-planners) Its really been great and sometimes the weeks are a TAD stretched because we'll have leftovers. Anyway, I need to share A LOT of recipes but seriously most of them have been so good that I've forgotten to document. The Shrimp and Crab Bisque from two nights ago however was totally worth documenting! (Well...I saved my Instastory and I hope that is sufficient) Y'all, it was SO good and we finished every last drop! Also, the best part is that it is super simple and has a super simple cleanup! 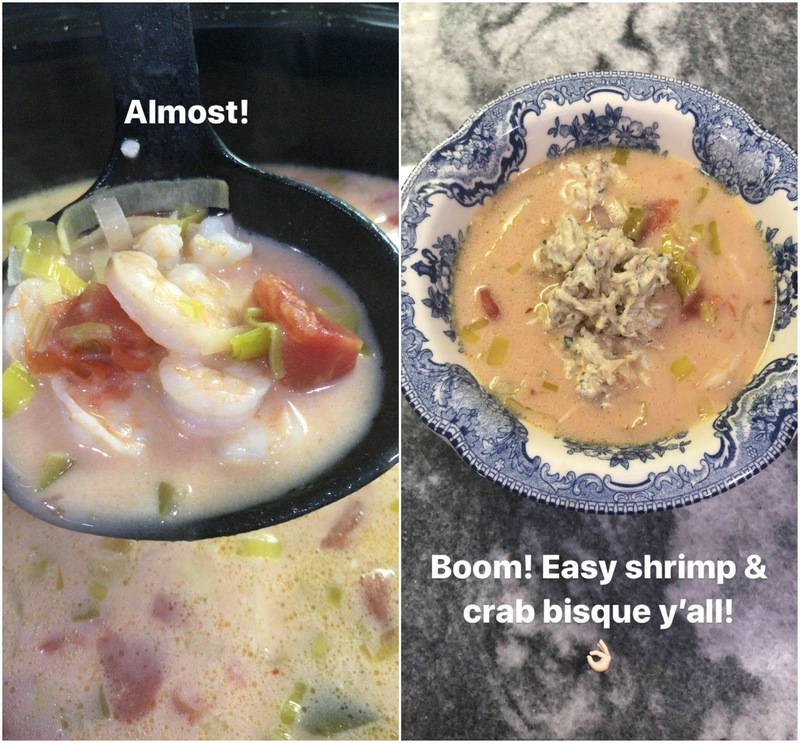 So, I hope my fellow seafood lovers enjoy and feel free to share your favorite (easy) weeknight recipes! Heat a skillet** over medium heat and add the oil and butter. Add the leeks and garlic, along with a pinch of salt and the red pepper flakes, and cook, stirring frequently, until softened, about 5 minutes. Transfer the leek mixture to the bottom of your slow cooker pot. Add in the tomato paste, stock, water, tomatoes, Old Bay seasoning, and sugar, stirring well to combine. In a mixing cup, whisk together the brandy/sherry and flour until smooth. Stir into the stock mixture. Add in the salt and pepper and cook in the slow cooker on low for 4 hours or high for 2 hours. Taste the bisque base for seasoning and adjust as necessary. Stir in the shrimp, cream, fresh crab, and parsley and continue cooking for another 15 minutes or until the shrimp are pink and cooked through. Keep warm until you are ready to serve. 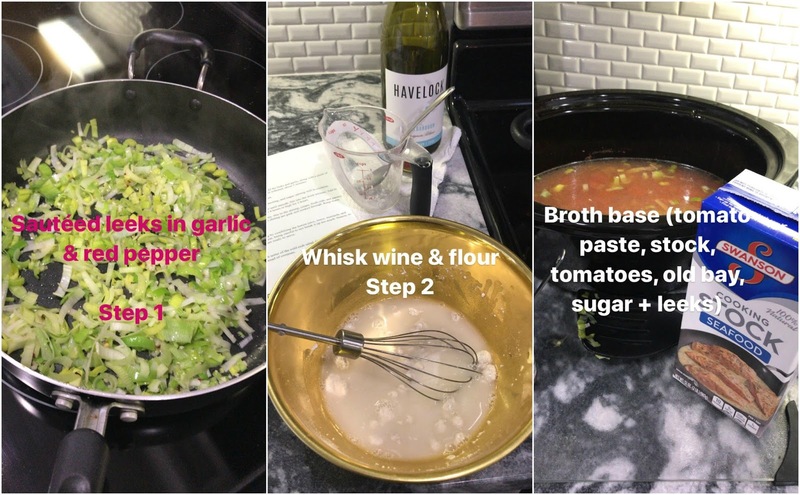 While your bisque is cooking, make the crab topping by combining the lemon juice, mayo, mustards, and parsley in a mixing bowl. Gently fold in the crab meat, being careful to not break it up too much. Season, to taste, with salt and pepper, Keep chilled until you are ready to serve. Ladle the bisque into serving bowls and top with some of the cold crab salad. Garnish with additional parsley, if desired, and serve while warm with toasted bread of croutons. I love anything with shrimp so this recipe is right up my alley! Thanks for sharing! Um, YUM! One of my favorite things is crab bisque. I'm super impressed you did this at home. Go girl! This sounds SO GOOD! I shared a recipe today, too, so great minds?! But seriously - this actually looks keto-friendly, too, so I'm adding it to my meal plan! Thanks lady! 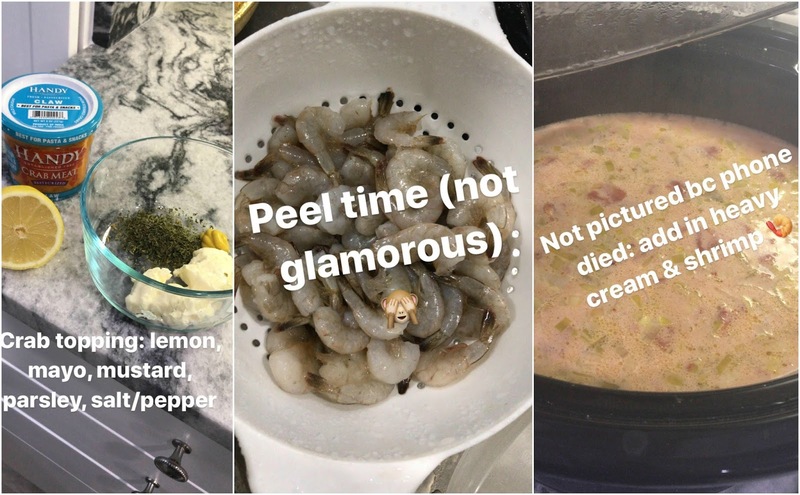 Loved seeing this on stories, so delicious! I need to do this with chicken like Kate says above because no shellfish for this Louisiana girl! Sounds so yummy! Perfect for a cold day! I just realized I don't follow you on instagram, just asked if I could! Have a great day! Can I just come over and you make this for me because it looks delicious!!! Thanks for sharing! I'm really hoping to get more into meal planning and prepping, hopefully make dinners a little easier during the week.